Truck traffic significantly improves deicer performance, deicers perform poorly below 10 degrees Fahrenheit, and brine is spread more by traffic spray and snowplow throw than by storm runoff. This is the outcome of multi-year tests performed in the snow-covered parking lots of two Twin Cities entertainment destinations. “There is notable airborne removal of deicers from road spray by vehicles and under high wind conditions. 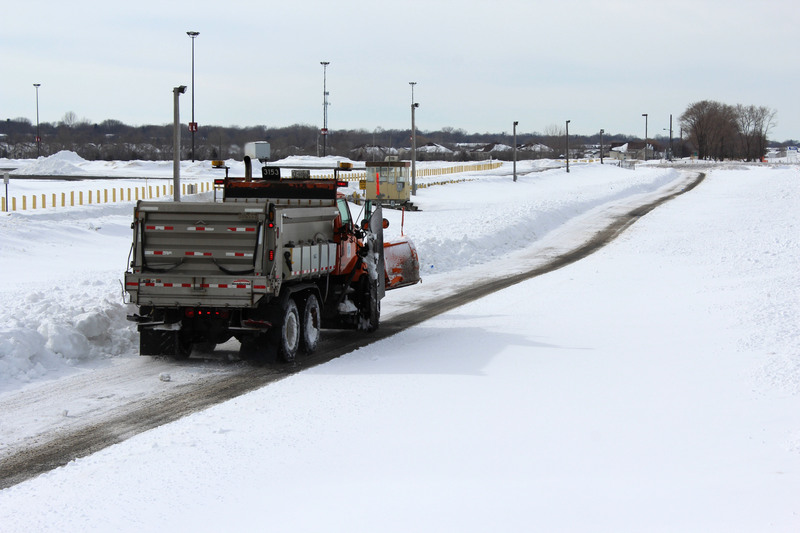 For the deicing materials MnDOT uses, little melt is observed below 10 degrees Fahrenheit,” said Tom Peters, Maintenance Research and Training Engineer, MnDOT Office of Maintenance. MnDOT has conducted several research projects to better understand the performance of both deicing and anti-icing materials (applied to the roadway before a storm to prevent or mitigate ice buildup). Two previous studies evaluated solid materials and liquid brine. In Phase I researchers examined over 50 deicer and anti-icing compounds and blends. They determined that ice melt capacity correlates closely with application temperature, which is the principal factor in effectiveness. Rock salt offers greater ice melt capability, but liquid deicers adhere better to roadways and cause less corrosion and environmental damage to road and bridge environments. In Phase II, researchers studied deicer performance in the field and considered how traffic levels, truck volumes, weather, pavement type and other factors affect performance. Research showed that deicers work better at warmer temperatures, with little effectiveness below about 10 degrees Fahrenheit. Truck traffic significantly improved deicer performance, contributing to wider and quicker melts. Chlorides were swept off bridge decks by snowplowing, and deicing effectiveness diminished as truck speed rose. However, severe weather hampered research in Phase II; the winter of 2013-2014 was the coldest experienced in Minnesota in over 30 years. 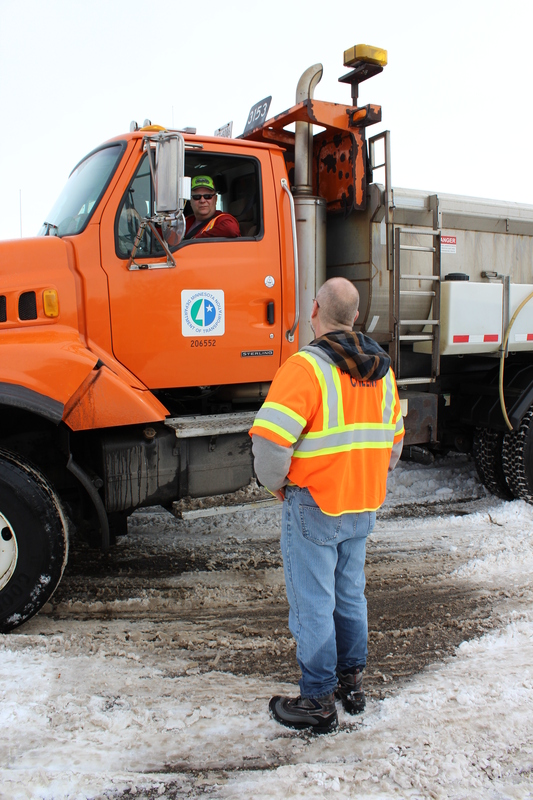 The severity of winter conditions impeded the temperature study of deicer performance and snowplow performance, leaving the research team and MnDOT interested in further study. This study aimed to continue the work of Phase II in more representative winter conditions. Researchers evaluated deicer effectiveness, plowing effectiveness, anti-icer persistence in traffic and drains, and pavement shedding of deicers. During the winters of 2015-2016 and 2016-2017, both of which were mild with below-average snow accumulations, the research team followed closely the methods used in Phase II. Deicers were studied at two facilities in Shakopee, Minnesota. One facility included nine 900-foot lanes on which plow trucks spread deicers at highway speeds. The other facility featured four 500-foot lanes, where deicers were spread by hand in 100-foot segments. Investigators monitored weather and evaluated deicer performance with photography and infrared thermography. Snowplowing by MnDOT Metro District plow operators was conducted at the two Shakopee facilities as well, at operating speeds of up to 30 mph. Researchers documented performance of various plow configurations in various truck combinations with on-site observation, handheld photography and time-lapse photography. Anti-icing, in which deicer brines are applied to dry pavement to prevent ice formation, was conducted on an elevated section of U.S. Highway 169 near Mankato that experienced actual traffic. Investigators recorded application rate, time, temperature, precipitation and traffic, as well as deicer flow and concentration in storm drainage runoff over time. A researcher mixes deicers in bags before spreading by hand at the test site. Researchers studied pavement shedding of deicers in a lab in terms of storm runoff flow and anti-icer concentration in drainage from artificially induced precipitation. Deicers were applied in brine form, dried, chilled and held at temperatures below the freezing point of water and within the range of effective ice melt temperatures. Research confirmed that deicer performance varies with temperature, with little benefit from rock salt at 10 degrees Fahrenheit or colder unless the pavement is exposed to sunlight. Deicer accumulated in drains at substantially lower levels than roadway applications suggest regardless of traffic conditions, confirming observations that the majority of deicer loss occurs from displacement by traffic and snowplows. Plow results were fairly uniform across all lanes and along lane lengths for a given plow type, suggesting truck, plow and driver combinations performed uniformly at each track. At higher speeds, snow rises higher in the curvature of the plow, and snow casts more broadly off plow ends and distributes to greater distances. “Truck traffic makes a huge difference on deicer performance. If two or three dump trucks that aren’t spreading but have weight in them follow a salt truck, salt use might be cut by two-thirds,” said Stephen Druschel, Professor, Minnesota State University, Mankato, Department of Civil Engineering. Deicers and anti-icers showed wider and quicker melting capability with traffic, especially by trucks, than without. Prewetting offered no significant observable benefit under most conditions, contrary to reports from snowplow drivers in field operations, unless snow was dry; then significant benefits were observed. Asphalt and concrete pavements shed salinity at high levels initially and at declining levels at about 0.3 inch precipitation. The type of pavement involved had no apparent effect on deicer runoff. The impact of truck traffic on deicer performance is significant and needs to be widely communicated. Reports that prewetting improves deicer adhesion in windy conditions and speeds the initiation of ice melt may warrant further review. Evaluation of atmospheric and off-roadway drainage may help quantify traffic-induced brine spray and plow throw. View Dr. Stephen Druscel’s YouTube presentation, Winter Plowing and Deicing: Saving Money, Salt and Labor by Distinguishing Best Practices. This post pertains to Report 2017-45, “Salt Brine Blending to Optimize Deicing and Anti- cing Performance and Cost Effectiveness: Phase III.” The full report and appendices can be accessed at mndot.gov/research/reports/2017/201745.pdf and mndot.gov/research/reports/2017/201745B.pdf. Minnesota’s transportation research governing boards put a new emphasis on financial benefits when selecting next year’s round of transportation research projects. MnDOT’s Transportation Research Innovation Group (TRIG) and the Local Road Research Board announced their Fiscal Year 2016 funding awards this week after hearing proposals from researchers in several states. They selected 20 research proposals hall-marked by novel approaches to improving the environment, increasing transportation safety, improving construction methods and boosting the bottom line. Researchers will test new technology that could make crack-free pavements; find better, faster and less expensive ways to reclaim roads; and even explore how to use waste material from road construction projects as part of the landscaping to absorb water runoff.